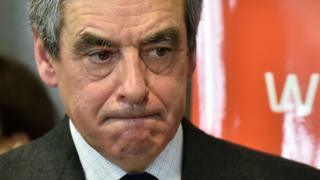 Francois Fillon has hit back at claims that his British wife Penelope was paid large amounts of public money for doing a fake job as his parliamentary assistant. In a television appearance on Thursday night, Mr Fillon insisted the work she did over more than eight years from 1997 was "real, legal and completely transparent". Describing Mrs Fillon's work at his constituency in western France, he said she had "corrected speeches, met important visitors... and chaired meetings". He went on to say that he did not "have the words to express his disgust" at the accusations in the media. It was a strong counter-attack but the controversy is far from over. A judicial investigation will take weeks or months, meaning that throughout the general election campaign the candidate will be dogged by what is inevitably being dubbed Penelope-gate. Even if Mr Fillon does provide proof to magistrates that his wife properly earned her €500,000 (£430,000; $534,000) salary, it is not the only issue at stake. Everything may have been done strictly according to the law - and indeed to common parliamentary practice - but the image many voters will retain is of yet another senior politician feeding from the public trough. Add in the second allegation carried by Le Canard Enchaine - that Mrs Fillon was paid 100,000 euros for a sinecure publishing job provided by a billionaire friend of her husband's - and you can see why right now Republican Party eyes are distinctly unsmiling. Thursday's French media were full of what is now inevitably being called Penelope-gate - with Mr Fillon's enemies relishing what they hope will be an embarrassing fall from grace. For the left-leaning French newspaper Liberation, Mr Fillon has "built his political personality around an image of rigour, sobriety, financial sacrifice and public morality. "A bit like the sinning preacher, Francois Fillon now has to his explain his contradictions to the faithful. Three months from a decisive election, it is a perilous exercise." Le Monde recalls that successive presidential elections in the past have been rocked by "boules puantes" (stink bombs) - allegations of corruption stored up by political enemies and then released at the most damaging moment. The paper says it is "anything but evident" that Mrs Fillon did the work that earned her the large salary. In its original report, Le Canard Enchaine quoted another of Mr Fillon's assistants as saying: "I never worked with her. For me she was the minister's wife." But it is not just Mr Fillon's image as a man of probity that is in danger, says Le Monde. There is also the fact that in his economic message he is urging the French to tighten belts and prepare for tough times. In the nation's current mood, there is little tolerance for politicians who come across as hypocrites. Less has been made of the second part of Le Canard Enchaine's story - the 100,000 euros allegedly paid to Mrs Fillon for work as literary adviser on La Revue Des Deux Mondes. The highbrow magazine is owned by the billionaire businessman and patron of the arts Marc Ladreit de Lacharriere, who is also a friend of Mr Fillon. According to Le Canard Enchaine, the only work Mrs Fillon produced between May 2012 and December 2013 consisted of two 400-word book reviews. And it quotes the then-director of the magazine, Michel Crepu, as saying: "I am stupefied. I have never met Penelope Fillon and I never saw her in our office." Less has been made of the allegation, because there is no public money involved. But the potential damage is no less real. Mr Fillon's supporters are furious that the allegations have been made public just now - a sign, they are sure, that the affair is politically orchestrated. They are right: the timing is almost certainly deliberate, and Mr Fillon's enemies may indeed be responsible. But that in itself is not an answer. French election 2017: Who are the final candidates?